The civilian 6-Series got its first and only major makeover in mid-1982. Externally, it was almost unchanged, but BMW claimed that a host of minor revisions reduced its weight by 156 lb (91 kg) in European trim, slightly less in federalized form. The front suspension was new, still using MacPherson struts, but now with BMW’s unique twin-pivot lower control arms [Author’s note: discussed in our 2014 updated MacPherson strut article], developed for the first 7-Series. There was also a new rear suspension, borrowed from the latest (E28) 5-Series, which revised the geometry of the semi-trailing arms to reduce the big coupe’s penchant for trailing-throttle oversteer. 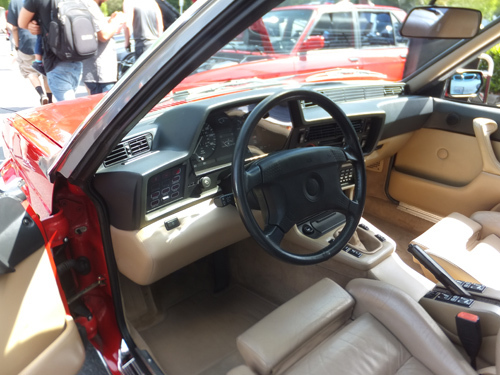 The interior got a facelift as well, adding new gimmicks like a complex and expensive trip computer, a fuel economy gauge (a depressing and generally pointless accessory in the thirsty 6-Series), and a “Service Interval Indicator” with warning lights that signaled the need for routine maintenance. The 635CSi also got a new engine, although it took a careful look at the spec sheet to notice the difference. The earlier M90 engine, whose wider bore had necessitated conjoined cylinder bores, had been troublesome and was different enough from the smaller M30 to make it expensive to build. In late 1982, BMW replaced it with the cheaper M30B34 engine from the 735i sedan. Displacement decreased from 3,453 cc (211 cu. in.) to 3,430 cc (209 cu. in. ), but power remained unchanged, at 218 PS DIN (160 kW). The new engine could now be mated with a new four-speed ZF 4HP22 automatic with lockup torque converter, providing better performance and better fuel economy than the old three-speed. The bigger news came in September 1983 with the announcement of the M635CSi. This used a new 3,453 cc (211 cu. in. ), 24-valve DOHC engine called M88/3, another derivative of the M88 engine from the M1 supercar. Developed by Horst Rech and Rainer Bratenstein, the M88/3 was the most powerful engine ever offered in a regular-production BMW, making 286 PS DIN (210 kW) at 6,500 rpm. The new engine was accompanied by a lowered and stiffened suspension and wider Michelin TRX tires. The sole transmission was a Getrag five-speed gearbox, linked to a limited-slip differential with a shorter final drive ratio than the standard 635CSi. Performance was appropriately ferocious: BMW claimed 0-62 mph (0-100 km/h) in 6.4 seconds and a top speed of 158 mph (254 km/h). Those figures made the M635CSi quicker than a Lotus Esprit Turbo and a close match with the substantially more expensive Porsche 928S2. BMW didn’t develop a catalyzed version of the M88/3 engine until 1986, so North American buyers had to settle for a federalized 635CSi with 182 hp (136 kW) and a price tag of more than $40,000. In that form, the 6er was still quick — performance was comparable to that of the U.S.-market Jaguar XJ-S and Mercedes 500SEC — but well behind even the basic European 635CSi. As partial compensation, ABS was now standard on U.S. cars, many years after it was introduced elsewhere. A driver’s side airbag became available in Europe in early 1985; it didn’t arrive in the U.S. until 1988. In 1986, BMW finally introduced a catalyzed version of the M88/3 engine, the S38. A North American version of the M635CSi, dubbed M6, bowed in December. Making 256 hp SAE (191 kW), it was inevitably slower than the European version, capable of 0-60 mph (0-97 km/h) in a little under seven seconds and a top speed of 144 mph (231 km/h). It was still a deeply impressive car, with assured handling, strong brakes, and sharp steering response. It was alarmingly thirsty, however; its EPA combined mileage was only 15 mpg (16.7 L/100 km) — a mere 12 mpg (19.6 L/100 km) on the current EPA scale — and its $55,950 base price didn’t include a $2,250 gas-guzzler tax. 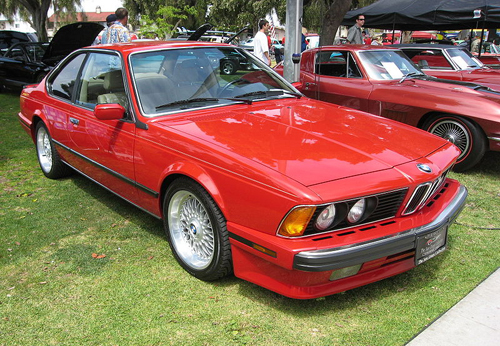 Starting in 1988, American buyers could settle for a stronger 635CSi with 208 hp SAE (163 kW). The emphasis on performance models is a little misleading because most 6-Series buyers opted for the standard 635CSi, about 60% of them with automatic transmissions. Just as significant for many customers were new options like rear air conditioning and all-leather interiors. 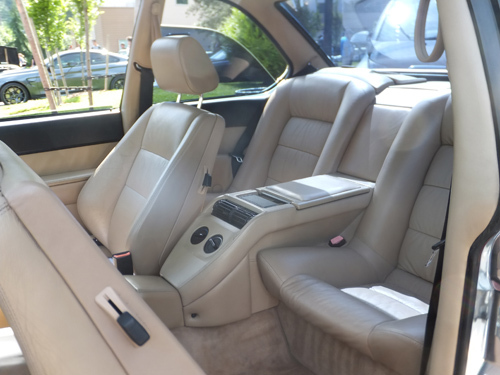 The demand for luxury features was strong enough in many markets that in 1987, BMW launched a 635CSi Highline edition (marketed in the U.S. as the L6), offered only with automatic and featuring almost every option and luxury feature in the catalog. Sales of the 6-Series grew steadily through most of its life. Total production rose from 4,933 in 1976 to a peak of 9,626 in 1985, with one brief, recession-induced retrogression in 1981. Sales only began to slip as production wound down, dropping to 1,064 units in 1989, the E24’s final year. Total production amounted to 86,216 units of all variants. The 6-Series consistently outsold the Jaguar XJ-S, which never topped 6,000 units a year, but often fell behind its Mercedes-Benz rivals. The latter comparison is complicated, because Mercedes dropped the R107 coupes in 1981, replacing them with the bigger W126 SEC line, but retained the older R107 roadsters through 1989. The SEC coupes alone often outsold the 6-Series, and if we add SL roadster sales to the tally, Mercedes comes out ahead by a margin of nearly three to one. The disparity is particularly noteworthy given that the Mercedes cost significantly more than the BMW. In Germany, a late-eighties BMW 635CSi cost around 80,000 DM (about $45,000), while a Mercedes 560SEC ran to nearly 140,000 DM ($78,000). The big-engine Mercedes were somewhat quicker than the 6-Series (barring the M coupes), although none was as nimble and none had the BMW’s enviable competition pedigree. However, the sales figures suggest that for buyers in this class, neither speed nor racing history was of prime concern, nor was price. As much as it may have pained Eberhard von Kuenheim, we can only conclude that Mercedes-Benz still held (and continues to hold) a clear edge in outright snob appeal. BMW management apparently reached the same conclusion. When development of the E24’s successor began in the early eighties, it was conceived as a far more sophisticated, far more expensive car, aimed squarely at the top-of-the-line Mercedes. 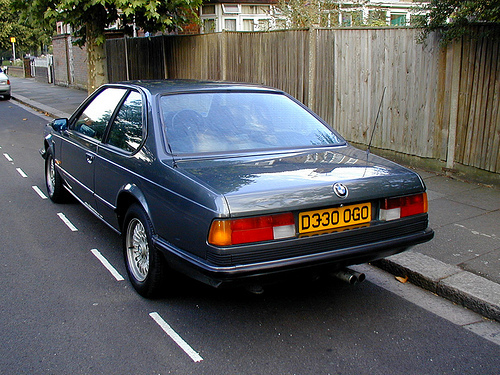 BMW eventually spent well over 1 billion DM (around €500 million) on the new coupe, the E31, which made its public debut in September 1989 as the 850i. Styled by Klaus Kapitza under the direction of styling director Claus Luthe, the 850i was striking, almost futuristic, powered by the 300 PS (221 kW) V12 engine from the E32 750iL sedan. Its price tag was equally striking: over 135,000 DM ($75,000) at launch, a hefty increase over the final E24. 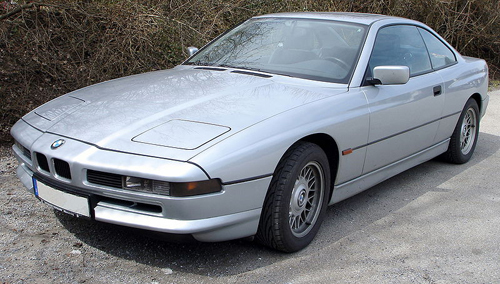 The reaction to the 8-Series was remarkably similar to the reaction to the E24 14 years earlier. Critics were impressed by its styling and technology, but critical of its 4,200-lb (1,900-kg) bulk, lofty price, and the fact that it was not substantially more exciting to drive than the cheaper and more practical 750iL sedan. The E31 sold reasonably well, considering the state of the economy at the time of its launch, but many BMW fans pined for the old M635CSi. 1. The 1977 Mercedes 450SLC as pictured is really just a 450SL with removeable hardtop in place. The SLC had a slightly longer roofline with a character line down the side of the pillar to differentiate itself from the roadster. 2. Another picture caption states that headlamp wipers were standard fit on U.S. 6-series models. This is untrue. 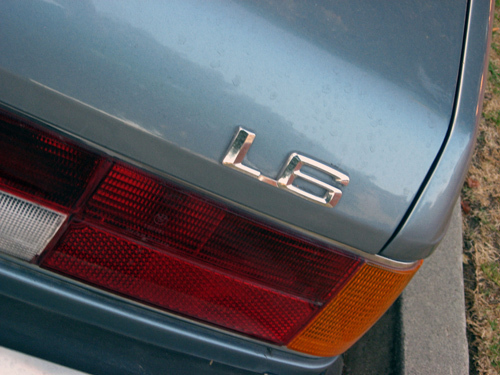 The U.S. 6-series never offered headlamp wipers even as an option, these were only available on Euro-spec models. It should also be noted these are very troublesome and are rarely found in working condition. 3.Another photo caption mentions the “power seat controls” to the left of the on board computer. These are actually switches for the heated seats option, with 2 levels of intensity available. Power seat controls on cars so equipped are located near the parking brake. 4. The next photo caption mentions Michelin “TDX” metric tires that many 6-series were equipped with. The correct term is Michelin “TRX” tires. These tires were perhaps worthy of more discussion as they have high prices and very limited availability today due to their odd size and outdated nature. This is why most 6-series models seen today feature wheels and tires from other models of BMW’s with more standard sizing. 5. Another portion of text says a drivers side airbag became available in 1985. When referring to U.S. cars, this is not the case. U.S. cars were only fitted with the second generation BMW airbag wheel and not until the 1988 model year. These corrections may be nitpicky, but they are important in understanding the story of the 6-series and especially how trim differed wildly by sales market. Thanks for the corrections! The TRX/TDX glitch was a typo (now fixed), and I’ve amended the text to reflect these notes. The 450SL was misidentified by the dealer selling it — it’s entirely possible they weren’t clear on the distinction between the SL with hardtop and the SLC, either. Very well-researched and written article. As a 6er owner and enthusiast, I appreciate the tribute. You’ve got a “subscriber!” Keep up the excellent work. Great article on one of my favorite BMWs. I do have one small correction: the MN12-platform Thunderbird that looks so much like a scaled up 6-series began production as a 1989 model. Ahah, you are quite right. I’ve made that correction in the text. 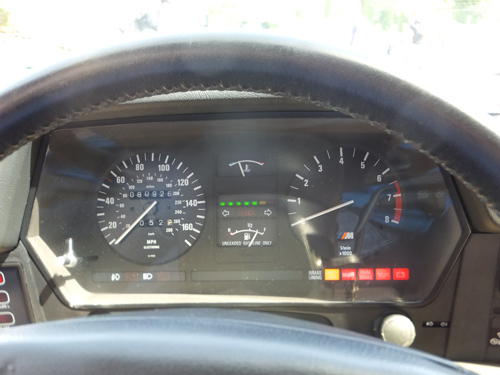 The early model 6ers can also be identified by their steel side view mirrors, plastic folding mirrors came along with the E28 based models in 1983 if I remember correctly. These cars are actually good. They are not ostentatious like the 21st century BMW 6 series. Love these! My first BMW was a gift in March 2015. 1984 633CSi automatic transmission. A month later, I rescued a 1983 from the junkyard. My 1967 Mercedes 250s is nice, but my 6 is a daily driver. I drove Fords my entire life and I’m now restoring Euro cars at my own pace. The engineering and design are amazing. As a young kid growing up in the StLouis Area, My dad had (3)bimmer 1988 m5, 1982 e24, 1987 325i e30, along with 3 son. After passing he actually gave the cars to us. Of course i was the middle son i got the e24. The was recked being seting in brother garage for 6 years or more, and the e30 my brother teenage is driving that one. To my suprise he have put over 3,500k into the it. New tires,piant job, muffler plus cat and header.He put some blisten shocks on it, did i mention the engine work, it was rebuilt. Now, for the e24, im restoring it with the OEM. I started last year around this time, i’m still have a long way to go. my problem is, i can’t find a dashboard for my car. living down here the south, in the terrible sun, totally desroyed the dash. But now i have a garage where i store the car daily. I have looked everywhere, UK, Canada, USA, and even in Germany, i even looked in the junk/salavage yards. What do you guys think, you can’t buy a new one becuase BMW stop making them, and if i do find one it’s in the junk yard (it’s just that… JUNK) worse shape than the one i have. try a dash topper instead which slips directly over your old one. There are many available for your E24. Why don’t you check with the auto upholstery shops? Some of them can recover them for you. It would probably be better then all the used ones. For BMW to nearly double their sales from 1966 to 1969 was pretty impressive. But I assume that a lot of the production capacity came from their acquisition of Glas. Capacity, certainly. I confess I don’t have a clear idea of what their production capacity was before that acquisition, although it appears they were not using all of whatever it was.